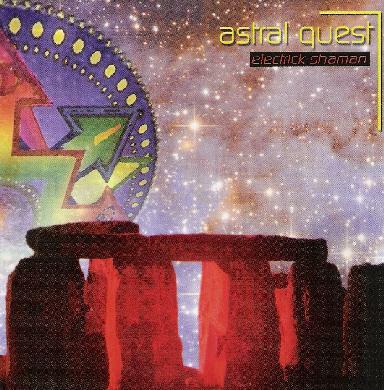 Astral Quest - "Electrick Shaman"
Astral Quest are a French heavy psych-rock trio led by guitar/vocalist Jean-Marc Devaux, along with Martial Baudoin on bass and Marc Chaniot on drums. Devaux released one earlier Astral Quest album in 2001 with a different bassist and drummer. Looking in the influences column on the band's Myspace site I was intrigued by the range of bands listed. There's Cream, Led Zeppelin, The Beatles, Kinks and Yardbirds, but also Hawkwind, Amon Düül 2, Gong, Syd Barrett's Pink Floyd, and even Van der Graaf Generator. And indeed the music on Electrick Shaman covers a range of territory that reflects these varied inspirations. The album opens with "Abducted", a decent progressive power trio psych-rock song. The acoustic "And Love Transcends Everything" follows. But with "Millenium Metanioa" things really start to take off. It's a hard driving, soulful Cream styled rocker with a great blues-psych edge and lots of really hot and tastefully played guitar work. "Talkin' Radio-Who" is a short, freaky sound collage bit that leads into "Someday We'll Go Back Home", a steady paced rocker that once again has a Cream flavor to it, but later develops into a melodic jam that brings to mind Abbey Road era Beatles. "New Born Child" is another song I enjoyed that has a Kinks sound, but with a punky/new wavey feel. Then there's a string of tracks that segue into one another to produce a kind of mini-suite. "Intro: No Fears No More" covers a lot of ground in just a few minutes. Its part Beatles, part Kinks, but also has some ultra bubbly psychedelic guitar, as well as some brief ripping heavy psych guitar bashing. This flows seamlessly into the next track, "AAwaltZZtlawAAwaltZZ", a very cool freakout jam with wild effects and is like a weird lysergic carnival soundtrack. This leads into "As The Children Play", a moody, spacey acoustic driven song with melodic shimmering electric guitar. The trip continues on "Illumination/Electrocution", which features four cosmic minutes of mind-bending guitar and effects that sound like something off Hawkwind's Space Ritual. And "Outro: Electrick Shaman" is similar to "Millenium Metanioa", being a Cream styled song that psych guitar fans will love. Finally, the album closes with "Bathe Yourself In The Sun", an acoustic-electric rocker with a late period Beatles sound. In summary, Astral Quest do an impressive job of synthesizing multiple 70s rock influences into a style that is based in psych-rock, but includes melodic song elements, experimental space rock, and good old progressive power trio hard rock. Check out their Myspace page for both songs and videos. If the videos are any indication, Astral Quest are a pretty hot live act. For more information you can visit the Astral Quest Myspace site at: http://www.myspace.com/astralquestgroup.